At Vision, we pride ourselves in our extensive face to face and online training and development. 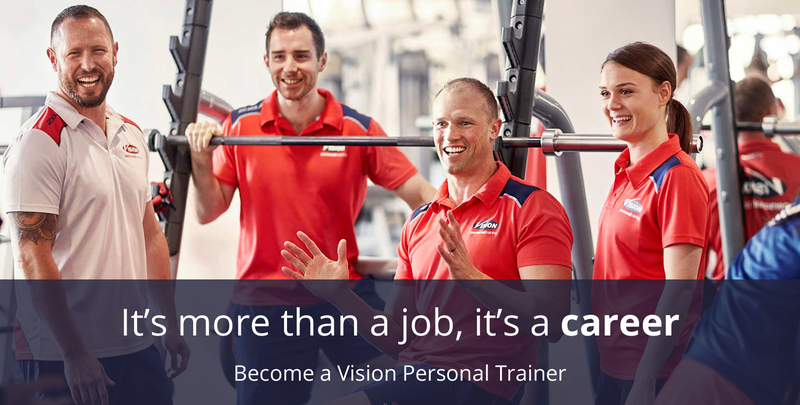 Whether you want to become the best trainer you can be, mentor other trainers or even manage or own a studio, Vision caters for you. Even if you are not qualified, we can help you with that too. Vision will look after all your Tax obligations. Vision look after all your insurances. Vision will provide you with a full PT Uniform. Vision looks after all the rent and overheads. Vision systems save you valuable time. Motivated to help people change their lives for the better? You’ll be right at home within our infectious Vision culture. Positive mindset shifts and life-transformations are part of our day-to-day. Believe a healthy body is the foundation for a positive life? Let your commitment inspire those around you, and we’ll support you with flexible working hours and an exceptional work-life balance so you’re always at your best. Looking for a fun, friendly space to prosper within? At Vision, our culture makes us unique. Our studios are filled with vibrant fitness enthusiasts striving to bring out the best in each other, encouraging us to reach our potential every single day. Qualified: Already have your Certificate IV in Fitness? We can’t wait to see your knowledge and skills in action during our Vision Mentor Program. Not Qualified: If you're studying, or considering a career in fitness, we pride ourselves in our extensive Trainer Experience Program. We'll help you develop into the best trainer you can be. We are proud to be recognised as an employer of choice in the fitness industry because of our focus on culture, our commitment to ongoing learning and career development, and creating an environment where each individual has the opportunity to be their best as part of a strong, supportive team. At Vision, your work matters and WILL literally transform lives. You'll be surprised the impact that has on yours! JOIN OUR TEAM - Send us an application.